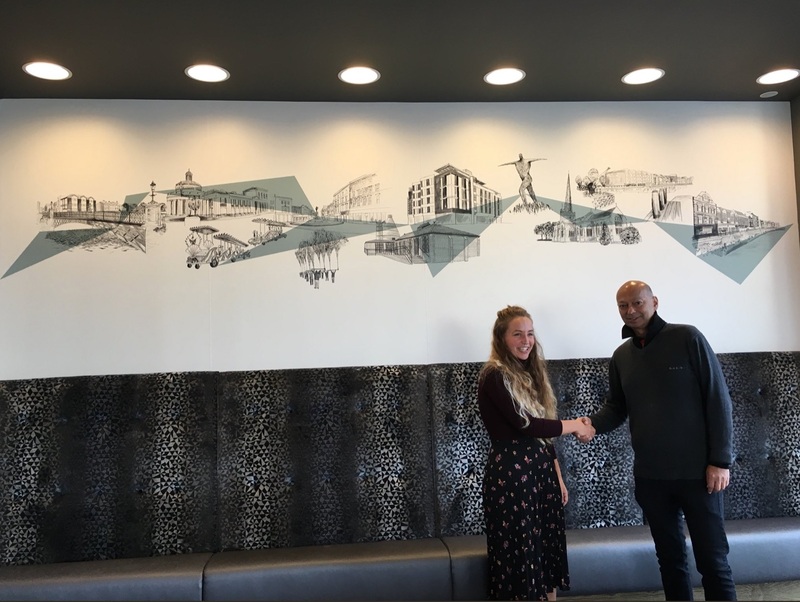 Hugely accomplished illustrator and surface pattern designer, HARRIET POPHAM, collaborated with Accor Hotels to create a townscape-inspired mural for the multinational hospitality company’s new Mercure hotel in Bridgwater, Somerset. As local creative talent, Harriet’s partciular knowledge of the area’s identifying landmarks and iconic events–including the striking Willow Man outdoor sculpture by Serena de la Hey, and the renowned Guy Fawkes Carnival–played beautifully into her composition of a truly bespoke artwork for the hotel’s bar and lounge space. The artist’s signature intricate line art–rendered in greyscale and featuring highlight-colour blocks in muted shades–was employed to brilliant effect in creating a visual environment for the hotel’s clientele that is at once tranquil and compelling, inviting anyone entering that space to lose themselves in a meditative way amidst the intensely detailed drawings.